Yes - here is a second post from me today. I have a little secret to tell you.....but not for another week or so. But until then, I am going to share some fun Stampendous challenges with you. 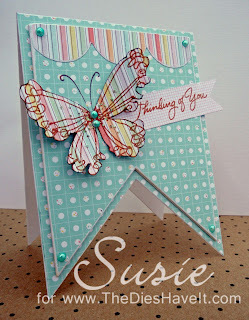 Have you checked out the challenge with the Stampendous team this month? Each Saturday in March, there will be a challenge to make a shaped card or project - something other than the traditional square or rectangular card. Doesn't that sound like fun? Here is the card I created for you. I think the banner shape is just delicious!! Be sure to come back tomorrow and I'll have another fun card to show you. See you then! this is stunning!!! Love how you created the banner shaped card! And that butterfly....wowee!!! Gorgeous! Ooooh!! I adore the banner shape!! WOW! Beautiful cards...I am just starting out and haven't been able to start a project as of yet. I just got my Cricut mini last week. Love the die cut shape on this and the paper-pieced butterfly. Susie, this is such a great shape card. I've never thought to use just one for a card!!!! what a unique and stunning shaped card!! and the butterfly is da'bomb!! super job!! Super cute card, Susie! I just love it...sooo creative! Love your shaped card...what a great idea!